Throughout the last four decades of Star Wars films, George Lucas and company have done a number of serious Jedi mind tricks on us. But after watching the heart-stopping trailer for Star Wars: The Rise of Skywalker, we're bracing ourselves for the twistiest of plot twists in the entire intergalactic franchise. If you spit out your water or beverage of choice when you heard Palpatine cackling at the tail end of the promo, reader, you were not alone. Long believed to be dead, Palpatine, played by 74-year-old Ian McDiarmid, could be back as a memory, holocron, or a Force Ghost (but the Sith version). It would definitely be disappointing if his evil cackling is just a red herring. But there's a good chance that he could be well, alive, and Rey's biggest threat (or father), potentially in a host body as he wreaks havoc. While his return is controversial, I, for one, am pretty excited to see how director J.J. Abrams will toy around with Palpatine in Episode IX. Sure, in a narrative sense, bringing back Darth Sidious could be a reach. We saw him die in Return of the Jedi nearly four decades ago! It's hard to parse out the stakes of the franchise as a whole if its bad guys don't actually die. Plus, if Palpatine is truly alive after all of these years, we're veering into the convoluted territory of clones, mind control, and who knows what else. Yeah, it could be a royal mess. Yet I'll be the first to admit that Palpatine is a great choice for a villain in Star Wars: The Rise of Skywalker (assuming that he will actually play that big of a role anyway). Emotionally and thematically, it feels right. The movie will be the last Star Wars installation that we'll see in a while, so there's a satisfying and poetic full circle going on if it ends with the villain who starts it. If you recall, Palpatine is the one who converts Anakin to the dark side in the first place. He embodies pure evil and is probably the most terrifying villain in the franchise. Even Darth Vader has an antihero vibe to him thanks to the prequel trilogy - his move to the dark side comes from his inherent love for his family. But Palpatine was nasty from the get-go, murdering his Sith Master after becoming the Senator of Naboo. He lies, cheats, and manipulates all for the sake of grabbing more power, for every position from Supreme Chancellor to Emperor of the galaxy. As a villain, Palpatine could progress the narrative in many different directions. His presence will likely push Kylo Ren to his limit. Even though Kylo has done terrible things in the past, there's now potentially a bigger villain on the loose who may get him to perform an act of self-sacrifice in the end - and, yes, I know that this is predictable even if poetic. Conversely, the First Order villain could become extra evil with Palpatine's influence and pose an even bigger threat to the Resistance, ratcheting up the tension in the galaxy. 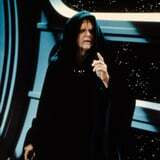 In either case, here's to hoping that J.J. Abrams will do right by Star Wars' one and only Darth Sidious!